As small crowd of media types looked on, Bushby, the 36-year-old former British paratrooper who is in middle of an attempt to walk around the world, and his partner, Kieffer, demonstrated how they planned to cross the Bering Strait between Alaska and Russia this spring, which represents the most difficult part of Bushby's journey. Dressed in black and yellow dry suits and bunny boots, Bushby and Kieffer took turns climbing into the water and backstroking to the other side, while towing their floating plastic sleds behind them. Once they reached the frozen shore on the other side, they unclipped ice axes they had attached to the front of the dry suits to pull themselves up on solid ice and snow. The two adventurers were making their way back across the river when an ambulance pulled into the parking lot at the Pioneer Park boat launch and two paramedics with the Fairbanks Fire Department hustled down to the river to see what was going on. Evidently, a passing motorist thought somebody was in trouble and called the fire department. By the time they got there, Kieffer and Bushby were safely on shore, their Gore-Tex dry suits already beginning to ice up in the 5 degree below zero temperatures. The two men told paramedic Doug Condon that they were training to cross the Bering Strait later this winter. Once he confirmed they weren't in trouble, Condon wished the men luck. "Sounds like a fun trip," Condon said. "I hope you make it." But there won't be any ambulances or bagpipers where Bushby and Kieffer are going. The two men are gearing up for an attempt to cross the treacherous Bering Strait between Alaska and Russia in February or March. For Bushby, it marks the continuation of a journey he began seven years ago when he left the Chilean town of Punta Arenas. Since then, Bushby has covered more than 16,000 miles through South and North America on what he has dubbed "The Goliath Expedition." His goal is to make it home to Hull, England, a total distance of more than 36,000 miles. Bushby showed up in Fairbanks in May 2003 after hiking up the Alaska Highway. He spent several months holed up in Fairbanks preparing for last winter's leg of his journey from Fairbanks to Cape Prince of Wales on the Bering Sea coast. Unfortunately, Bushby received a rude awakening to Bush travel in Alaska. Right from the start his trip was marked by hardship. Towing a sled laden with more than 200 pounds of food and gear, Bushby's decision to travel across the Minto Flats just outside of Fairbanks turned into a nightmare because of deep snow. The same was true for his trip down the Yukon River. Bushby ended up breaking trail through deep snow for days at a time. At one point when he was camped on the 80-mile stretch between Tanana and Ruby, an Alaska State Trooper flew out and dropped off food and fuel to keep him going until he reached Ruby. In the end, Bushby stopped in the Bering Sea coast village of Unalakleet before his visa ran out and he had to leave the country. "I went out there pretty raw and ran into all sorts of problems," is how Bushby describes his trip across Alaska last winter. At the same time, he said, "I learned an awful lot." This winter, Bushby will pick up where he left off last year by flying to Unalakleet sometime in the next week. From there, Bushby will tow a sled up the Iditarod Trail 220 miles to Nome, where he will then hook up with Kieffer, whom he met on the trail last year. The two men will continue north on foot to the village of Wales, where they plan to head across the strait. There are still many "issues," as Bushby calls them, to contend with but he continues to forge ahead, consumed by his dream to walk around the world. During Thursday's hour-long press conference and slide show at the College Coffee House, followed by the demonstration in the Chena River, Bushby and Kieffer mapped out their ambitious plans. The Bering Strait crossing has lured a variety of adventurers in the past two decades who have used several different methods to try and get across the 56-mile stretch of moving ice and open water, including bike, car, tank, dogsled, kayak and balloon. All but two have failed or been rescued. The only known successful crossing of the strait is by the father-son team of Dmitry and Matvey Shparo of Russia, who crossed it in 1998 after getting rescued on their previous two attempts. It took them 30 days and they drifted approximately 220 miles to get across, landing well north of Wales. "As far as we know nobody has ever made it from Alaska to Russia," said Bushby. In October, Bushby and Kieffer met with Belgian adventurer Dixie Dansercoer and Troy Henkels of Alaska, who attempted to cross the strait to Siberia and back in early April, only to be airlifted off the ice after eight days. When they were picked up, the two men were 55 miles south of their starting point in Wales and their efforts to travel west were thwarted by the drifting ice pack they were traveling on. "They'd camp and they would wake up and they'd be 20 miles south of where they were," said Bushby. To avoid that, Bushby said he and Kieffer will be traveling at night, using night-vision scopes mounted to helmets that were provided by one of their sponsors, MoroVision. "Some people call it foolhardy," Bushby said of night travel. "If you're going to do something like this you have got to be willing to push the limits." In addition to the night-vision equipment, Bushby has some other new high-tech gadgets he hopes will aid in the crossing. One is a parafoil kite that has a wireless camera attached to the string so Bushby and Kieffer can get an aerial view of the surrounding landscape. The camera is hooked up to a hand-held screen that will allow Bushby to look at the ice ahead. "That gives us an instant aerial view," said Bushby, who plans to use a GPS for navigation. The two men will be using kayaking dry suits made by Kokatat during the crossing. They plan to swim across open leads in the ice, towing their floating sleds behind them, rather than circumvent them. "Most people who set out to cross the Bering Strait go out with the idea of staying dry," he said. "We're planning on getting wet. "I figure we're going to spend 50 percent of our time on the ice and 50 percent in the water," said Bushby. Bushby and Kieffer will have a satellite phone and emergency locator beacons in the event they need to call for help. As for possible polar bear encounters, Bushby isn't too worried, especially since he will be armed with a shotgun and pistol. "I cannot confirm any polar adventurer that's been attacked or eaten by a polar bear," said Bushby. In addition to the firearms, Bushby said he will set up a motion detector on a ski pole whenever they pitch camp to alert them of possible four-legged intruders. "Anything that moves around camp and it screams like a banshee," said Bushby. How all his high-tech equipment works in the cold and ice remains to be seen and Bushby admits as much. He isn't sure how the dry suits will work or how badly they will get iced up. "We're still playing with a lot of ideas," he said. "That's all part of the process. This is a learning experience. "Our chances of making it are pretty slim," a realistic Bushby said. "We may hit it like a brick wall and bounce back but we'll be back next year and the year after that and the year after that to try again. "This is my life," Bushby said. Dimitri Kieffer is a medium built, unassuming average looking person with a twinkle in his eye and a French accent. He has an interesting haircut at present and I forgot to ask him where or how he got it. It consists of close cut spirals around his head. It probably should alert one to the fact that he is a bit different. After the ususal rigamorole with the data projector and technology he started to tell us about his trip across Alaska in the 1800 mile Iditarod from Nome to Anchorage. He has been racing the long distance races for a number of years now and his CV is interesting in that it starts off with the conventional comrades type races, moves to the 100 milers, then to 300 milers and then makes a quantum leap to the 1000 milers plus. His background includes adventure racing and all this lays a solid foundation for his epic trips. When asked how he trains he admits that he doesn't really have a training programme as a lot of his time is spent recovering and preparing for the next epic. It is obvious that the strongest part of him is his mind. The main focus of his talk was not the physical stresses or problems, but the sights, incidences, people he met and little things that he hadn't realised when planning. The sights he experienced were generally for his eyes only as he was pretty much alone after the first four days, when the main dog race was long gone. His seconding consisted of collecting his gear and provisions from the post office of the next town where he had mailed it to himself, and the hospitality of the people. In the wilderness, he kept himself entertained with the Aurora Borealis (Northern lights), his mp3 player and his thoughts. He dedicated a day to imagining himself falling off a cliff and having his life flash before his eyes, except he had a day to look at his life in a flash. Esoteric stuff, we could probably all do with. He saw a pack of wolves skeletonize a caribou in 5 minutes, leaving a clean skeleton and some entrails in a patch of pink snow. In the harsh environment he got to understand snow shoes first hand, how to pull and push a sled, how to fix a sled with limited material, and all the problems related to gear. He found that a camel pack froze very quickly and, only after experimentation, that an ordinary thermos was the best way to carry daily drinking supplies. Frost bite is an ever present enemy and he explained how important planning is for stops and simple tasks, like toilet stuff. Four layers of gloves make anything problematic and things like chocolate are really only good for breaking your teeth. 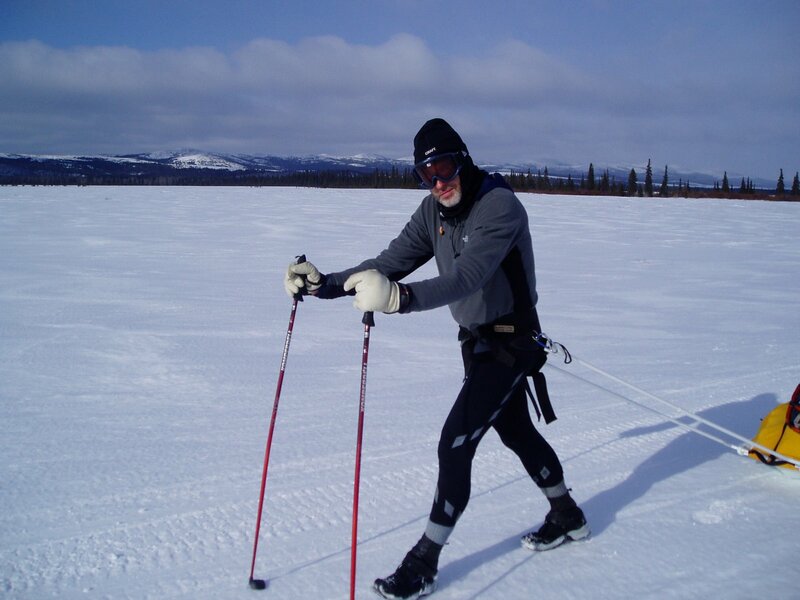 He used a pair of Montrail Susitna Gortex running shoes and had no feet problems once. The Gortex water proofing and a pair of gaiters kept him dry and mobile. This blew my mind. I have started to do berg hikes in my Montrails and even though people tell me I need a good boot, I actually don't believe them. Dimitri proves this. 1800 miles in thick snow at -30 C is a good test for a running shoe. He used the same shoes in the desert across Niger and said they were also great for that, keeping sand out and breathing in the heat. He spoke on the local people, the inuits and the indians and how different their lifestyles were. We saw pictures of cars buried totally in the snow, waiting for summer when they will be renovated and used until winter literally buries them again, Snow ski's, snow shoes an ski's are the winter transport and in summer a lot of the area cannot be traversed because of swamps, black flies, bears etc. Dimitri showed how a mind is opened by adventures such as this, and how sterile and unchallenging city life really is. Although we face real threats every day, little has to do with the environment, mostly it is people who are hazards. He did mention how he avoided some towns, but also mentioned how the amazing the people he met were. From ex navy seals to everyday folk who just happen to live in a harsh environment, we realised how adaptable man is. He hopes to reach Paarl with enough time to learn how to K1 effectively. His legs were sore after a 10;47 Comrades, but when he left on Friday morning he looked for all intensive purposes happy. Richard lent him a bike carrier and he was getting organised and settled in to the long haul (2200km) ride. Dimitri was riding on wrong side of road at one stage but Richard reminded him that this is South Africa and everything returned to normal. Update: Having just spoken to David Waddilove (10.30 20/6), Dimitri had a rough day first day getting lost and arriving at 1:00am at the checkpoint. Wessel Cronje left at four on the second day to try and make an early break from the bunch, but everyone is back together now and climbing into the Maluti mountains at 3 degrees Celsius. Iditarod Walker Dimitri, standing under the Burled Arch in Nome at last contemplates his Alaska Ultra Sport trail finish after 37 days and 19 hours (about three times as slow as the Iditarod huskies) and 1049 miles from Anchorage to Nome. He says he enjoyed the walk, but he won't be back next year. as he has committed to several other extreme sport competitions in far-flung places on the globe such as South Africa. Dimitri Kieffer, Alaska Ultra Sport competitor, walked from Anchorage to Nome in 37 days and 19 hours, finishing Tuesday, April 5. Only six Ultra Sport Iditarod Walkers have finished the 1,049 mile long trail since 1989 — five men and one woman. As a surprise, his father, Henri, met him near the village of Solomon after flying all the way from France. Kieffer grew up in France, but has lived in Seattle for the last 20 years working for Microsoft. He left his job and Seattle behind to pursue the Ultra Sports and extreme sports worldwide. The last few hundred miles were rather solitary as the other walkers scratched at Iditarod when the rains began. Somehow he soldiered on to Nome through it all. He met a lot of nice people along the way and wants to thank again all the postmasters who opened up the post office when he came through after hours so that he could get his supplies. Everyone was so nice. School officials were friendly and let him to the school. He stayed in Koyuk for several days so that he could repair the hole in his plastic sled caused from pulling the sled on the dirt near Egavik. School Principal Lane Douglas was most helpful in lending skis for the sled repair after the fiberglass patch would not dry right. 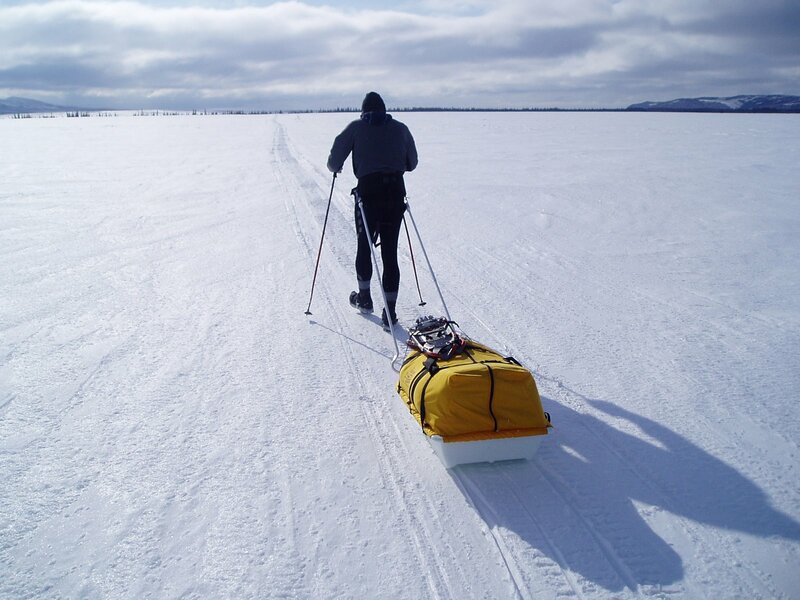 He was pulling 60 pounds of gear in the sled, which included a -40°F. sleeping bag, a tent, small stove with white gas and snowshoes, spare shoes and overshoes for the overflow. The tent fit over the upside-down sled, which served as the tent frame when he needed to camp. Because Kieffer was so far behind the Iditarod mushers, he was at times left with no trail from the dog race. From Shageluk to Anvik, there was lots of overflow. It took five days to traverse the distance from Grayling to Kaltag with a 75 m.p.h. headwind. Near Egavik he observed wolves catching a caribou from a large herd. Other wildlife were a bison near Nikolai, and he saw a moose in Skwentna and Tokotna. Moose were dying of starvation around Nikolai because the snow was so deep only the tops of the trees were visible, he said. Footgear for the trip were Gore-Tex shoes (Montrail Susitna) with special reinforced insoles and gaiters. He did not use the overshoes. Foot care was very important, and he applied a no-friction Vaseline-like salve — hydropel cream — every day, which prevented foot blisters. His nose became frostbitten when the temperatures dipped below zero during the last days on the trail. His diet on the trail was heavy on fruits and nuts, chocolate and also raw bacon. He did get some smoked salmon on the Yukon and muktuk at Koyuk. •The northern lights, which were spectacular at times — almost magical. •Seeing the first Iditarod dog team and musher at Tokotna and the last one near Shageluk. •Hospitable villages along the route which enabled him to absorb a lot of the culture. •Walking at night between Golovin and White Mountain. •The nice cabins at Topkok and near Elim. •The practicing adventurers he met along the way, especially the one near Old Woman near Unalakleet. • Listening to a lot of different music on the trail to Nome. The iPod he had contained a mixture of music ranging from Brazilian, French, Rap, and also comedians such as Bill Cosby. He also used the iPod shuffle so that the music or other numbers would turn up unexpectedly, which relieved some of the boredom on the trail. Walkers sleep a lot between checkpoints, he said. Sometimes he saw no one for three or four days. He had a GPS and maps — referred to as GPS miles. The trail markers were still there from the Iditarod Sled Dog Race for the most part, but the trail was no longer packed. Except for the adventurers in training, Kieffer never saw anyone walking. He encourages people to do more walking or hiking between villages, as it is a beautiful country. The skiers he observed were on organized ski meets for their school. The dog mushers he saw were Iditarod mushers. Next, Kieffer will go to South Africa to the Cross Karoo Multisport— biking 1,300 miles, running 55 miles and canoeing 140 miles.